Peridot is a French word that is derived from the Arabic word “faridat” meaning gem. 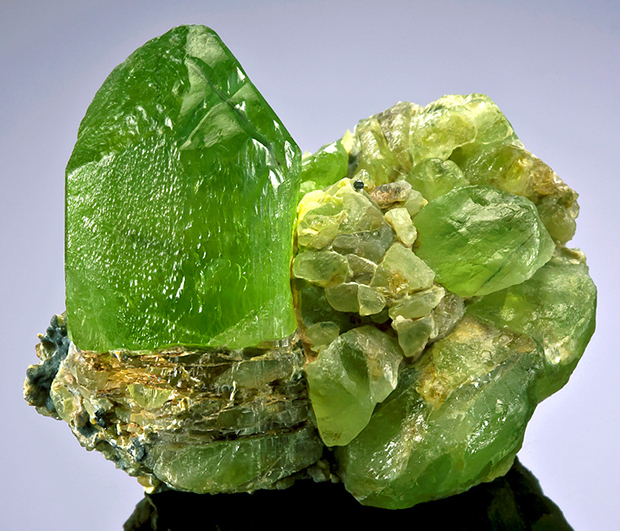 The green gem is found in rocks created by volcanoes and in some cases, it forms as a result of meteors that land on the earth’s surface, however, this peridot is much less common. It has even been discovered on Mars and the moon. Peridot is one of the oldest known gemstones, with records dating back as early as 1500 B.C. Historically, the volcanic island of St. John, in the Red Sea, had the most important deposit that was exploited for over 3500 years. 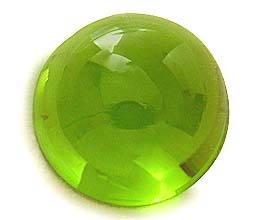 Today, the finest quality peridot comes from Burma, although Pakistani peridot is now highly regarded also. Peridots were often mistaken for emeralds. Green gems were one of the favorite gemstones of Cleopatra but it was highly likely that some of the “emeralds” worn by her were actually peridot. The prices and value of peridot vary tremendously and are based on the size and quality of the particular gemstone. Peridot is considered one of the more affordable green stones available. Generally, darker versions of the stone are more expensive. As a wedding anniversary gemstone, peridot are given as gifts for the 16th year of marriage. It’s Celebration Time! 20% off our new range of Keum Boo jewellery that’s launched today. Yippee!!! We are very excited to announce the arrival of our new Keum boo range of jewellery. Keum boo is the ancient Korean technique of fusing 24ct.gold onto silver. We have been developing this work for a couple of years, getting to understand and master the technique and evolving the jewellery to a point where we are really pleased with the pieces. In fact, we are quite chuffed with the range . We hope that you like it too. We are so excited about our new range that, for the next two weeks, we want to celebrate with you by offering a 20% discount on all of the Keum Boo jewellery. Simply enter the code “KB20” at the checkout on our website. Here is a small selection from our new range. It is made from Silver and 24ct.Gold. The complete range can be found on our website at www.JandDField.co.uk Now that it has been launched on our website, we are aiming to supply our outlets with it soon. Our new Keum boo range of jewellery. Silver and 24ct.gold. Oxidised circle Keum boo earrings. Oxidised Keum boo square earrings. Silver and 24ct.gold. Oxidised Keum boo flower ear studs. John’s lampwork glass bead necklace. 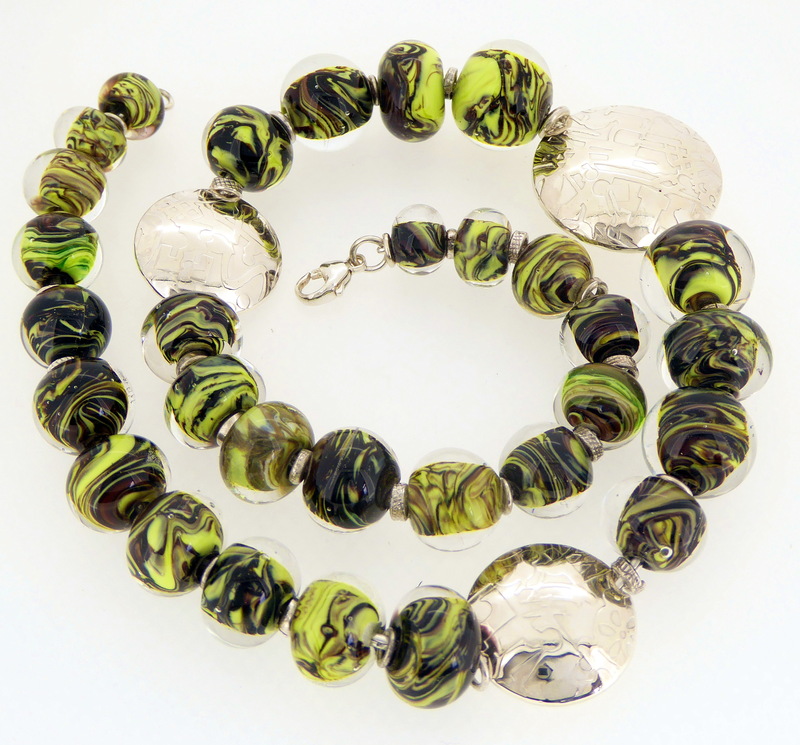 Hand made glass beads, sterling silver. John made this beautiful necklace for a birthday present for me a couple of years ago. It always gets lovely comments when ever I wear it. Each of the glass beads are individual and although they blend together on the necklace they are each little works of art in their own right. The dome shaped silver discs work really well as focal points and give a feeling of sophistication to the necklace. Hopefully John will be making similar necklaces soon. 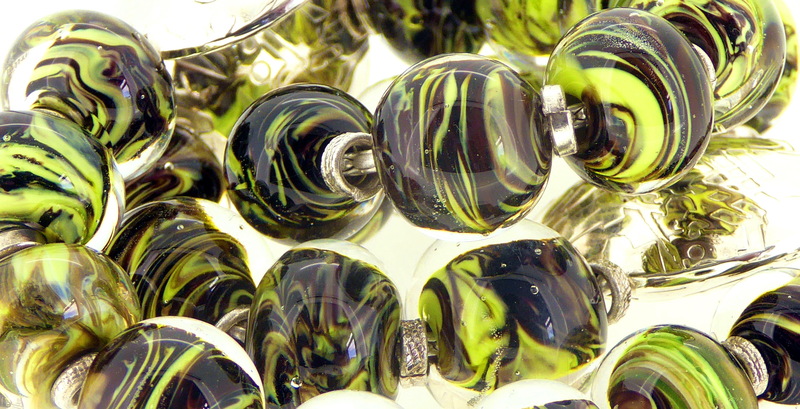 Detail of the glass bead necklace. John’s lampwork. 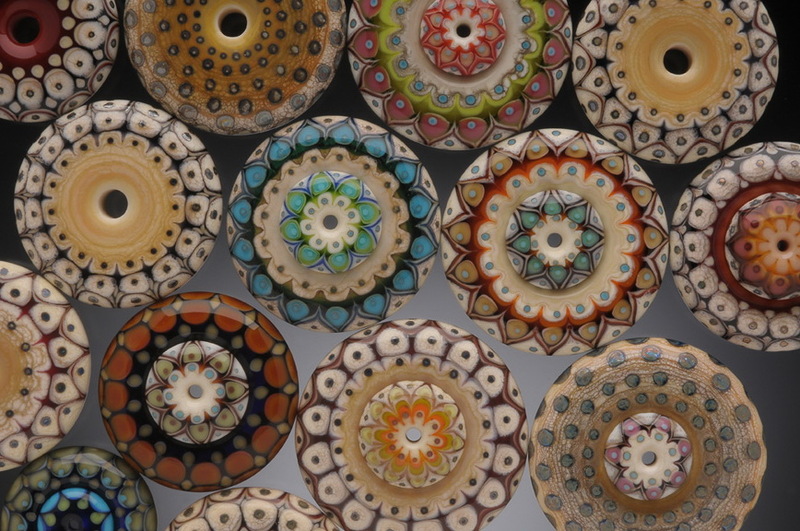 A passion for glass beads. 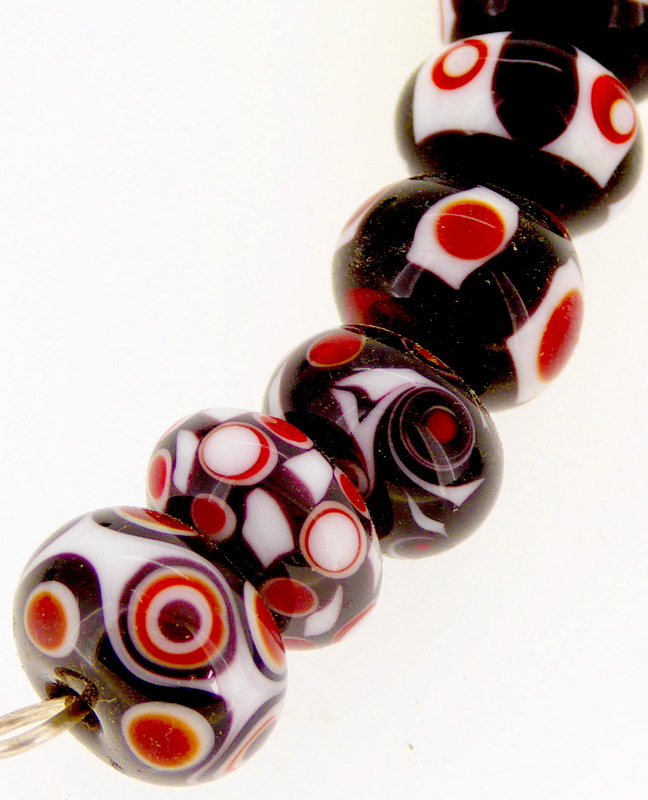 Johns lampwork, beautiful glass beads. 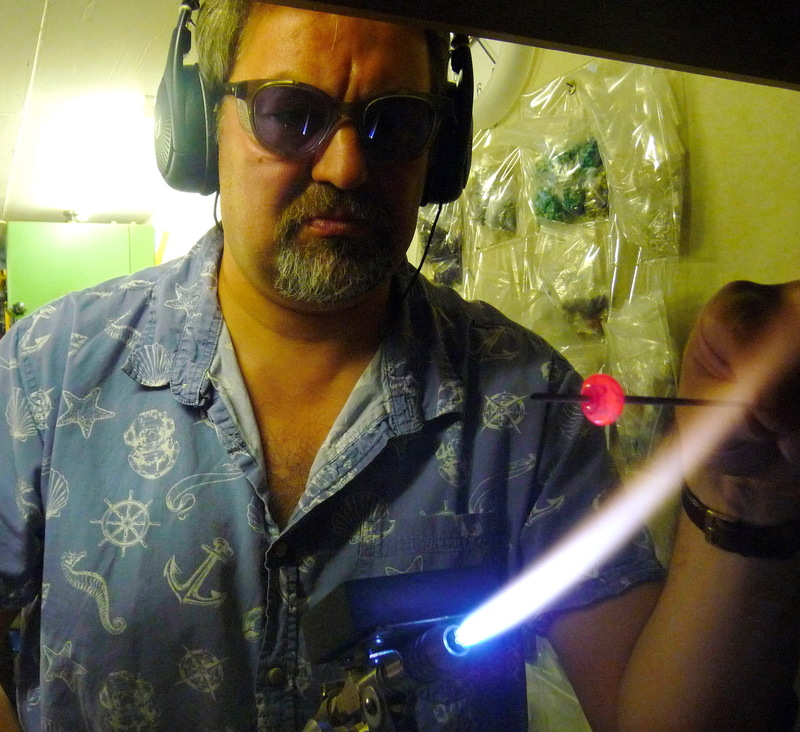 When I have any spare time you will find me back in the workshop making glass beads. I have made beads on and off for ten years. As of yet the beads have been made as a hobby, purely for fun but hopefully in the near future maybe we will be able to incorporate them into a new range of jewellery . 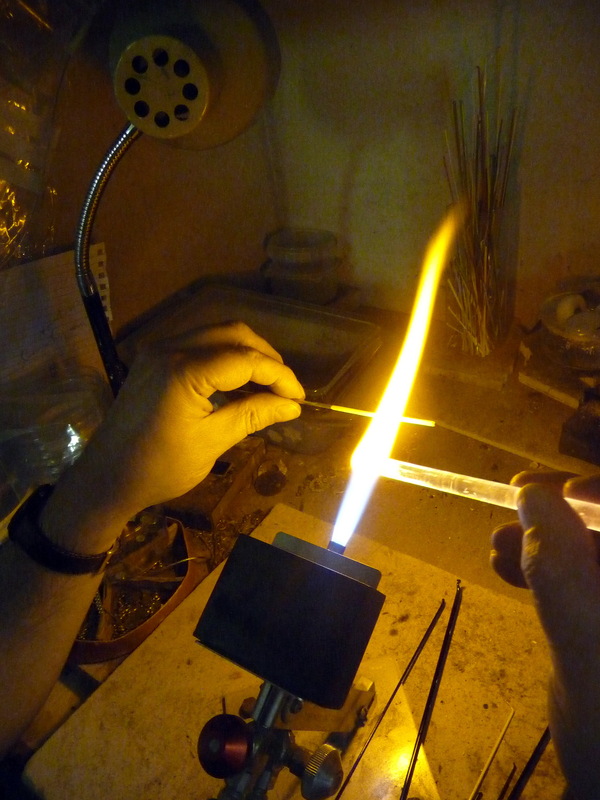 The basic concept with lampworking is to have a blowtorch facing away from you fixed to a work surface and to melt the end of a glass rod until it is soft. This is then wrapped around a steel rod which then forms the hole in the bead. The rest is just practice and experimentation. The only training that I have had was a half day course with Teresa at www.Tuffnellglass.com which is where I get most of my tools and materials from. 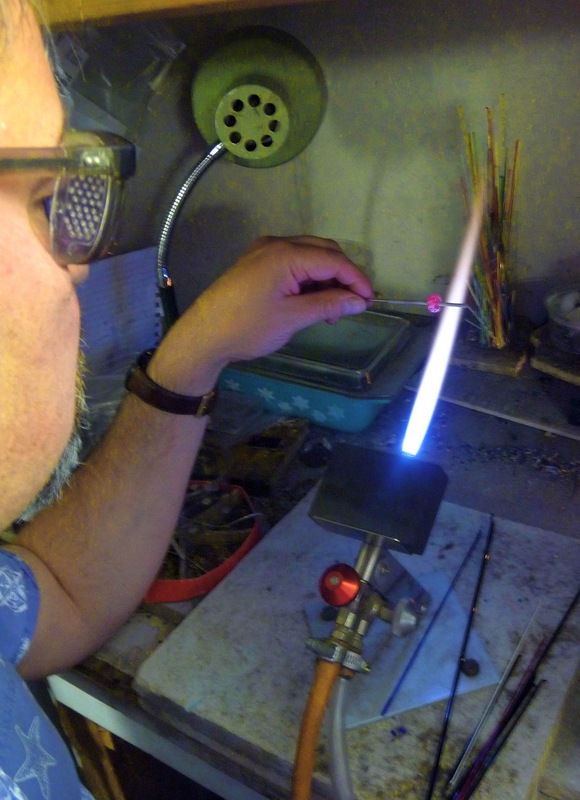 I use a Nortel Minor Burner and Effetre glass rods. 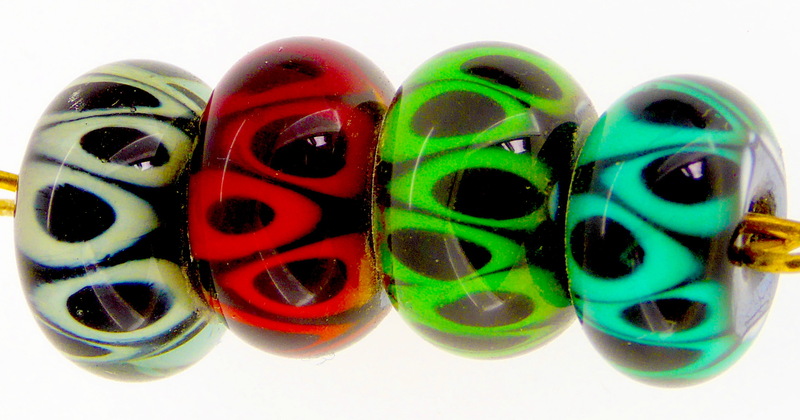 Johns lampwork, we love the hot glowing colours of these glass beads. A selection of glass stringers. 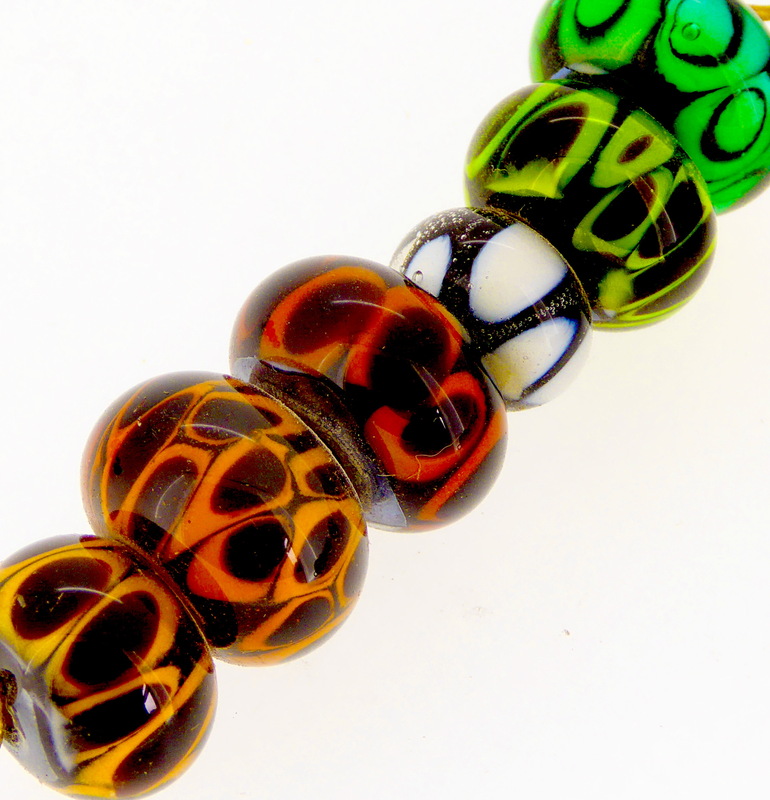 I particularly like the spots on these beads. 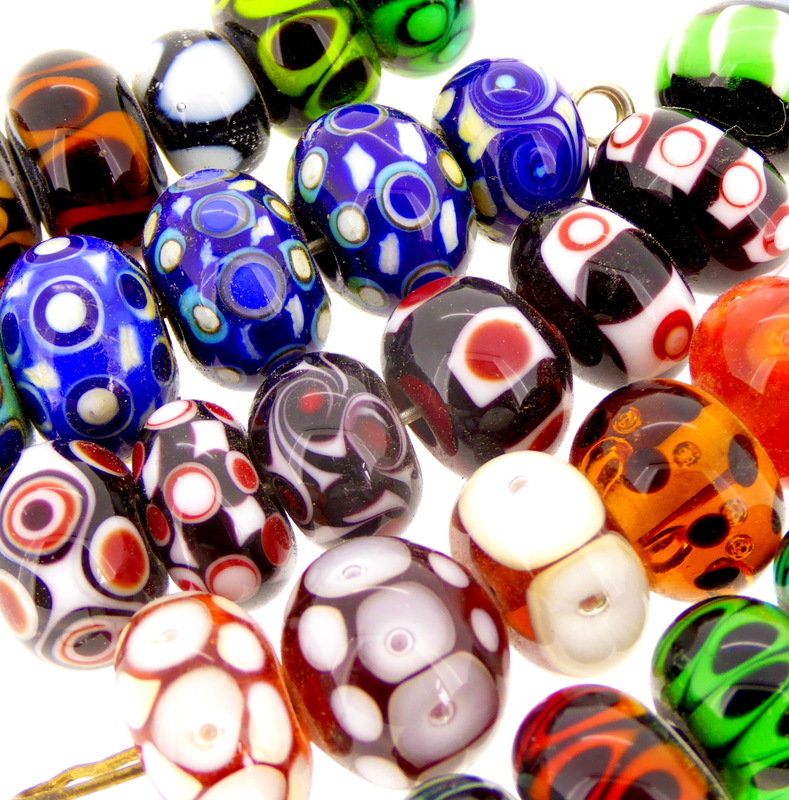 These are some of our favourite glass beads. 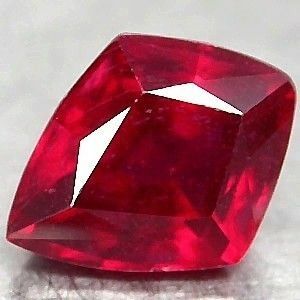 The word ruby is derived from the Latin ‘ruber’, meaning red. 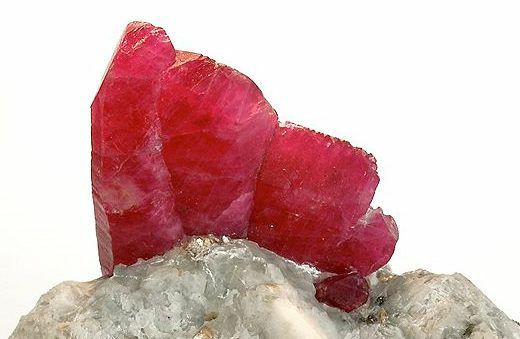 It was once used to describe all red stones, including red tourmaline, red spine and red garnet. The ruby is one of the most highly prized of gemstones: large rubies are harder to find than large diamonds, emeralds and sapphires, therefore their value increases with size more than any other precious stone. Rubies have been found all over the world, including in Myanmar (formerly Burma), Thailand, Africa, Australia and the USA. Some have even been mined in Scotland. The most precious rubies are those with a full, rich red colour with just a hint of blue tones. Originally, the finest rubies were mined in Myanmar and it is from there that the term Burmese ruby began to describe the finest rubies. 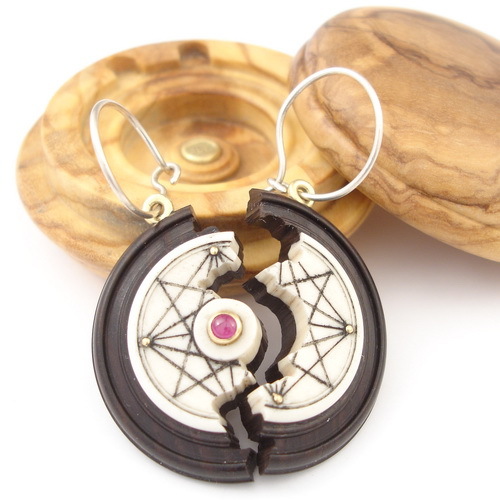 John’s halved ruby earrings with their own Spanish Olivewood box. John’s one off halved ruby earrings, snugly fitting into their own Spanish Olivewood box. 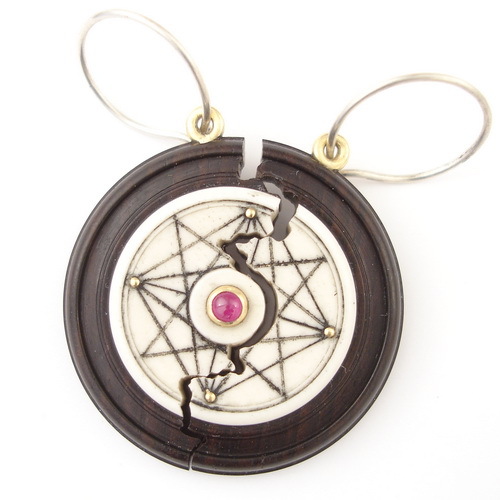 These earrings are made from African Blackwood, bone, ruby and 18ct gold. They can be seen on our website on the halved ruby earrings page. John enjoys making these one-off pieces as they are a challenge and they always turn out differently with the design developing as they are made. 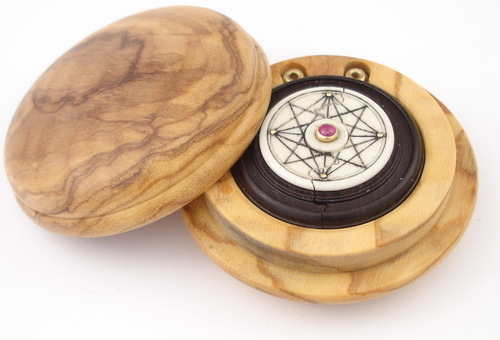 The Spanish olivewood box is made to fit perfectly around the earrings with the lid having a friction fit.